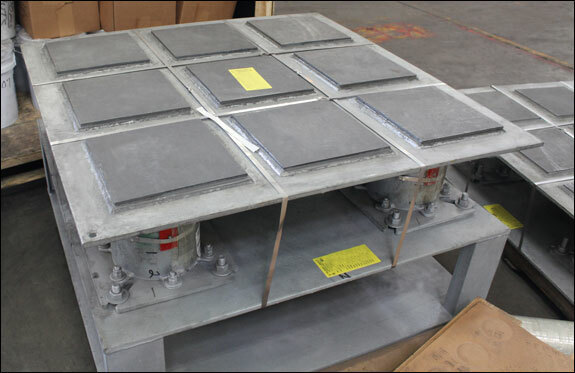 Graphite slide plates can be used in place of PTFE, 25% glass filled slide plates for higher temperature applications. 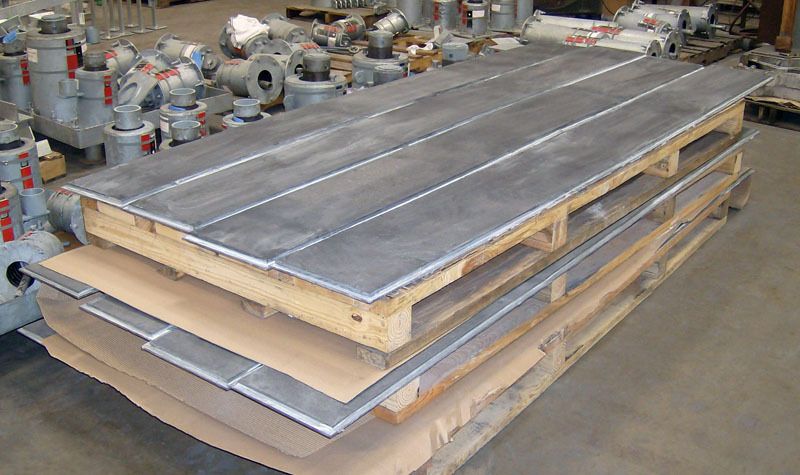 Pure Graphite Slide Plates are recommended for those systems which produce exceptional pressure and heat. 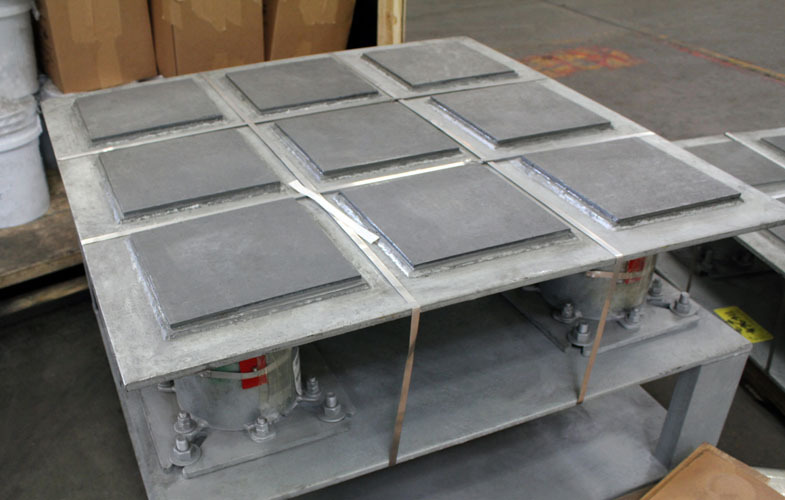 With a range of up to 1,000 degrees Fahrenheit for ambient conditions and 3,000 degrees Fahrenheit for inert settings, graphite slide plates can also handle up to 2000 PSI. 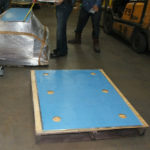 Prior to Welding: Locate the slide plate base in the appropriate position on the existing steel surface. Place a protective covering on the graphite. Where seal welding is not required, follow the diagram shown which indicates 1/8” thick fillet weld, 1” long every 4” around entire perimeter of the base. For welding, use GMAW 0.035 wire or SMAW 3/32″ stick. Where full seal welding is required, use a similar pattern of welding until a full weld is obtained. This method will prevent damage to the graphite. 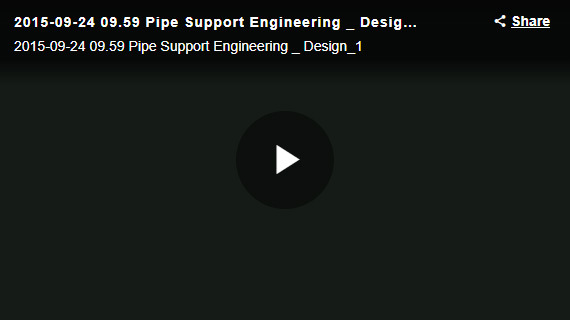 (A full weld will help prevent seepage of water between the slide bearing plate and the support structure.) Avoid overheating, which may destroy the bonding of the graphite to the base plate. 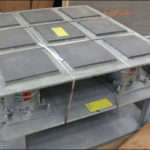 Installation in Concrete: Secure the top and bottom elements together with paper adhesive tape. Then attach the bottom element anchor bolts with wire to the form. After the bottom pour is made, repeat on top element. During the first expansive cycle, the tape will break. 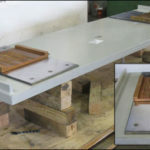 What is the use of a slide plate? What are reasons why the PTFE or Graphite pads peel off the backing plates? 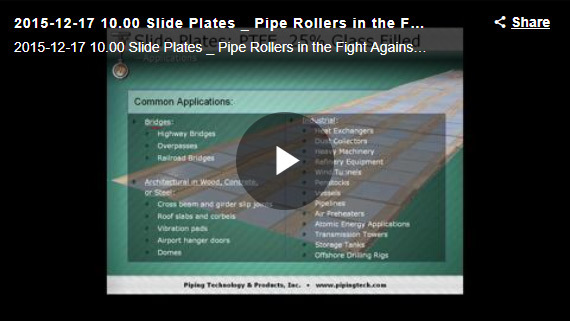 For applications above 400 degrees F, what material is recommended for slide plates? 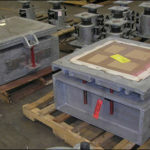 The graphite plates come in two different configurations, the ‘bonded’ and ‘bolted’ assembly. 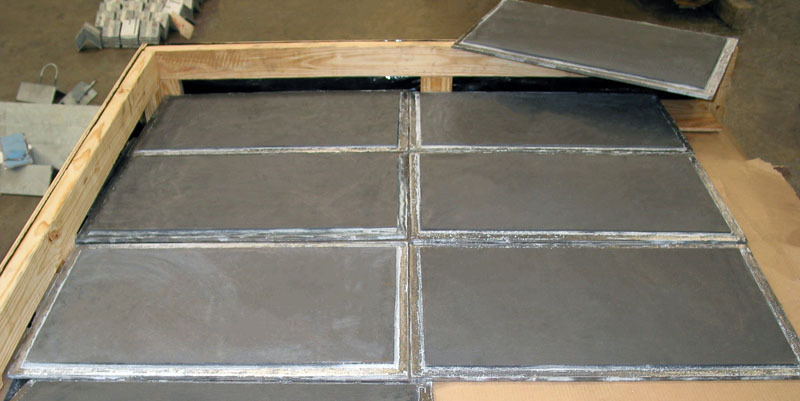 The bonded configuration consists of a ¼” thick graphite pad bonded to a metal backing plate. 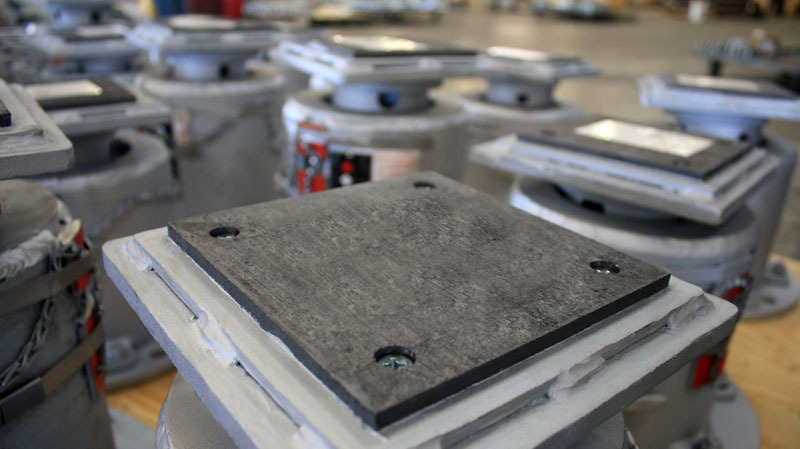 The bolted configuration consists of a ½” thick graphite pad bonded and bolted to a metallic backing pad. 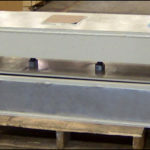 Both configurations can either be tack welded or fully welded to support components. • No surface treatments, grouting, or expensive mechanical attachment necessary. • Unaffected by weather conditions. • Ability to absorb dirt and grit within itself. • Self-aligning when used in conjunction with elastomeric backing pads. 1. 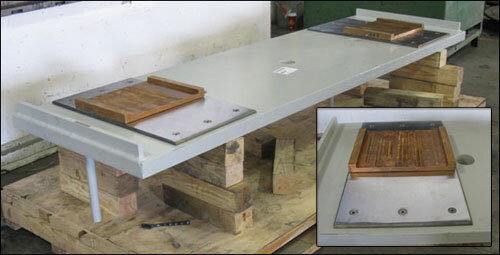 Please specify the dimensions of the upper plate and dimensions of the lower plate. 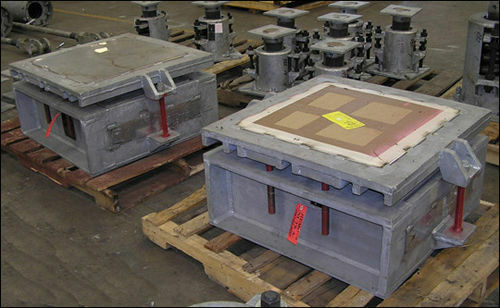 It is common practice that the upper plate is generally larger than the lower plate. 2. Specify lip dimension (if different than the standard 1/2″). 3. 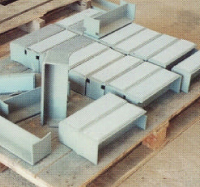 Specify base plate thickness (if different than standard 1/4″). 4. 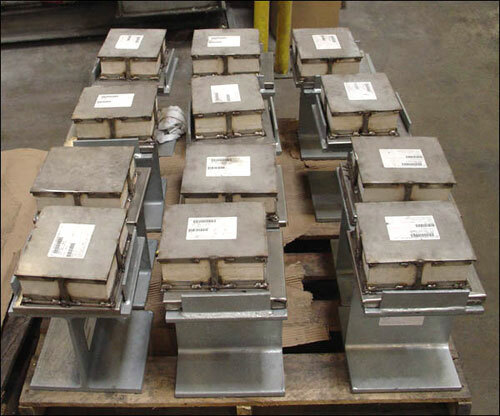 Bolting upper plate is recommended at temperatures above 200°F. Bridges: Highway bridges, overpasses, railroad bridges. 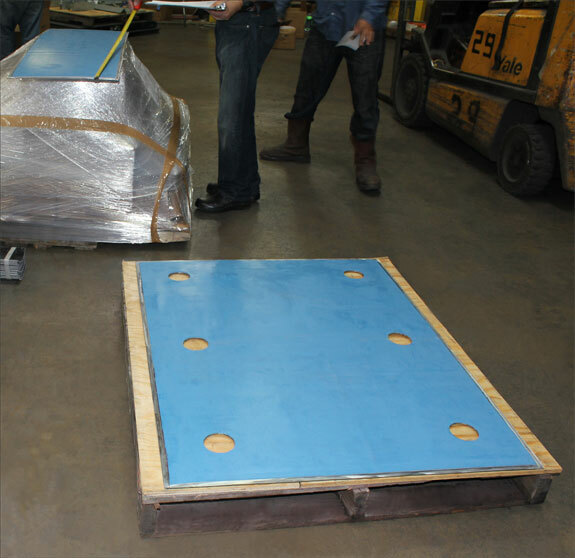 Architectural in Wood, Concrete or Steel: Cross beam and girder slip joints, roof slabs and cor-bels, vibration pads, airport hangar doors, domes. 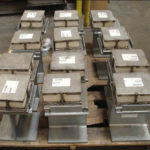 Industrial: Heat exchangers, dust collectors, heavy machinery, refinery equipment, wind tunnels, penstocks, vessels, pipelines, air preheaters, atomic energy applications, transmission towers, storage tanks, offshore drilling rigs. Across Grain BTU x ft.